When the Travel Channel calls! Like many of you, I had the pleasure of attending the Iowa State Fair this year. But this was no ordinary fair experience for me. It all started back on June 15 with a simple email with the subject line “Bizarre Foods: Delicious Destinations — Researching Iowa.” As it turns out, the Travel Channel is doing a Delicious Destinations episode in Des Moines next season and a producer wanted my opinion about the must-eats that make Des Moines, and Iowa in general, so special. She had purchased my book, A Culinary History of Iowa, and we chatted over the phone about iconic Iowa foods — ranging from breaded pork tenderloins and Dutch letters to Maid-Rites and sweet corn — that should be part of the show. Then came the biggest surprise. She asked, “Would you be willing to be our food expert? We’d love for you to meet the crew for your interview at The Corn Stand by the Varied Industries Building at the Iowa State Fair on Aug. 13.” What an honor to help share the amazing story of Iowa agriculture and our unique food culture. Watch for the episode on the Travel Channel sometime in the next year! Making the Iowa-Asia connection. People around the globe are interested in the story of Iowa agriculture. On Aug. 8 my family and I were honored to host grain buyers from Vietnam and Thailand at our Century Farm. These buyers wanted to meet the farmers who grow the Iowa soybeans that are crushed into oil and soy meal and shipped worldwide. These products feed the livestock that provide high-quality protein through meat to nourish Asia's growing population. I’m always amazed to think our farm, and thousands of others across this country, are the first step in providing protein for a hungry world. Blueberry boost. Speaking of food, I felt a blueberry crisp coming on after I visited the Berry Patch near Nevada. 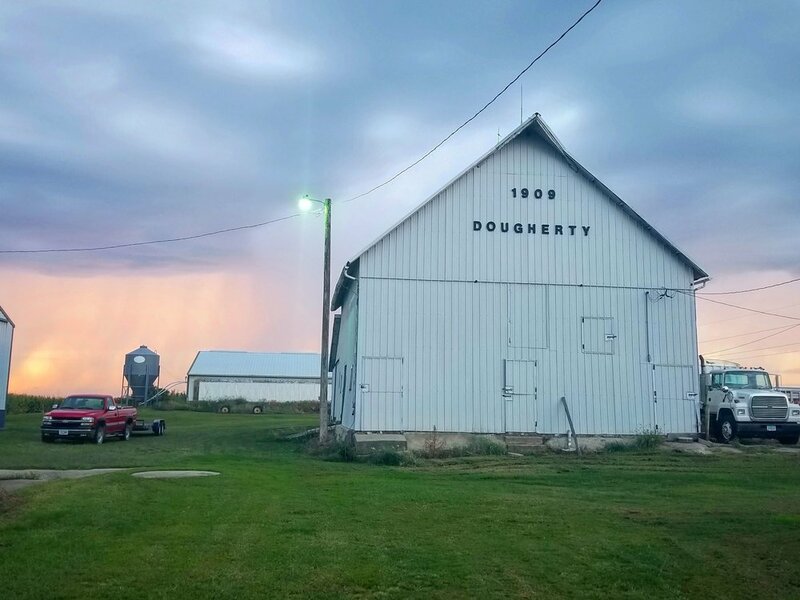 I was writing an article for Farm News about this unique farm, which has been providing homegrown food raised with sustainable farming methods for nearly 50 years. Yes, there are Iowa-grown blueberries, and boy are they good! If you’d like to make your own blueberry crisp, I’ve included the recipe at the end of this article. Overachiever corn. While we were dry in July, we received plenty of rain in August. One day, the rain fell so steadily that my rain gauge overflowed — and it holds nearly 6 inches! All the moisture was great for the crops, especially soybeans. It also benefits the corn. When I was checking the corn with my brother, Jason, we spotted an “overachiever” with four ears. Normally there's only one ear per corn plant. Ah, the perks of being on the edge of the row, with all the sunlight you can get and less competition from the neighboring corn plants. Lilies connect the past, present. Our gardens also thrived this summer. The tiger lilies that grace the garden at my family’s Century Farm have bloomed every summer for decades. I think they were planted by my Grandma Katherine Dougherty, although they may go back even further. More than just a flower, these lilies are a link between the past and the future. Foodie friends in Johnston. It was great to make some new friends during my Culinary History of Iowa book program and tour on Aug. 11 at the Johnston Public Library. I was excited to meet Peg Rasmussen, who is a loyal Iowa Food & Family Project supporter. Prairie potential. There’s a first time for everything. I got lost on an Iowa prairie this summer! I just had a little trouble finding the group at the “raising prairie for profit” field day northwest of Spencer at the Prairie Flower. 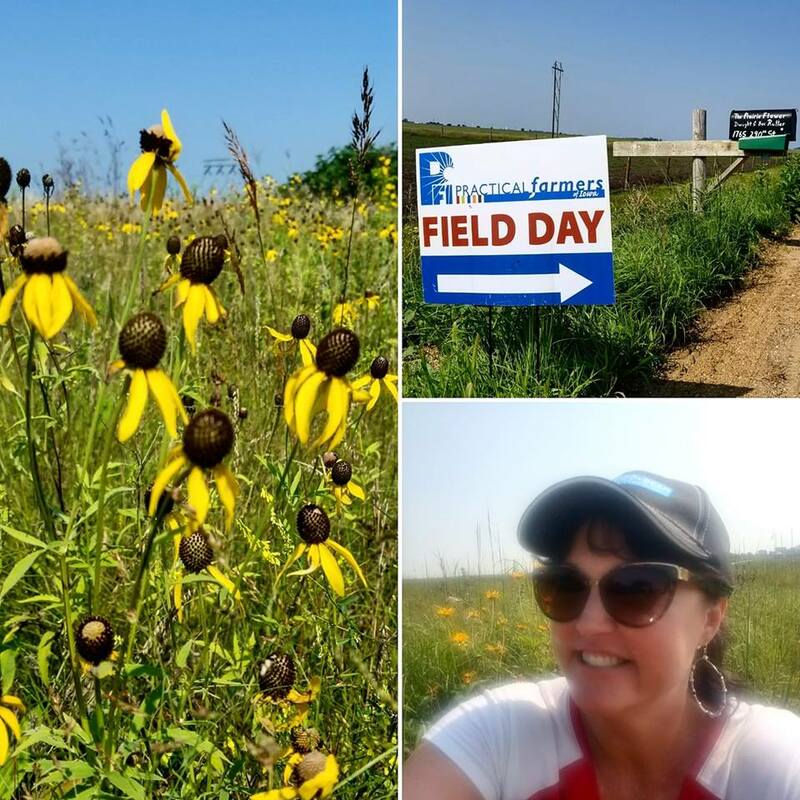 Once I arrived at the field day, it was wonderful to see how my fellow Practical Farmers of Iowa members are managing their land. Prairie plants offer a great way to improve the soil, attract pollinators and provide other environmental benefits. I also learned that prairie plantings aren't just for farmers and rural landowners. Bev Rutter, who owns and operates the Prairie Flower with her husband, Dwight, has helped with prairie plantings along bicycle trails in Iowa, in Mapleton after the western Iowa town rebuilt following a 2011 tornado, and in Spencer, where bioswales help manage surface runoff water to control pollution. “Folks in town can definitely add prairie plants to their backyard or other small areas,” Bev Rutter told me. Learning from one another. Field days are a big part of farm life in the summer because they offer a great opportunity to learn from other farmers. Nearly 40 people stopped by a recent Calhoun County Corn Growers’ conservation field day near my hometown of Lake City. On Mark Schleisman's farm we learned about cover crops. Then we headed to Dwight Dial’s farm to talk more about soil health, cover crops and soil organic matter. We also got to see Dwight’s new solar array, which powers his entire farm, from the house to the livestock barns. So inspiring to see my farmer friends and neighbors focus on continuous improvement! Safe T Homes in Haiti. Ag innovation goes beyond the farm. When I visited the Farm Progress Show near Boone in late August, I toured a Safe T Home® from Sukup Manufacturing in Sheffield, Iowa. The home looks like a mini grain bin, and the concept took root after the January 2010 earthquake devastated Haiti. Sukup employees designed the metal Safe T Home, which are virtually earthquake proof and they have been built in Haiti, Africa and Peru. In 2016, Hurricane Matthew devastated Haiti with winds more than 145 mph and all 200 of the homes prevailed with just minor damage. The Safe T Homes were able to hold up to 60 people in each home to ride out the storm. This is just one more example of how Iowa ag is making a positive difference worldwide! Dog days of summer. It’s not all work and no play here. I've been wanting to take Maggie the Red Heeler to Dog Night at Principal Park in Des Moines for four years — and we finally made it! Maggie got to strut her stuff in the dog parade on the field before the baseball game and made her debut on the jumbotron. Go, Cubs! While the weather transitions into fall, it’s not too late to enjoy another taste of summer. 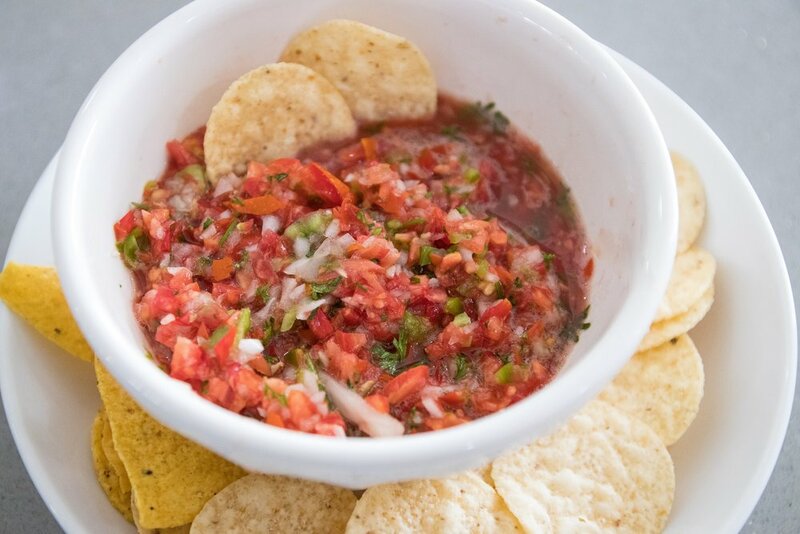 Try this simple Sensational Salsa recipe, and enjoy this wonderful time of year. Preheat the oven to 375 degrees F and butter a 2-quart baking dish. Make the filling: Toss the blueberries, granulated sugar, flour, lemon juice and salt in a medium bowl. Transfer to the prepared baking dish. Make the topping: Combine the brown sugar, flour, oats, lemon zest, cinnamon and salt in a separate bowl. Using a fork or a pastry blender, work the butter into the flour mixture until coarse crumbs form. Scatter the topping over the blueberry mixture.